We often don’t stop and think about many of the rights and freedoms we enjoy today. If we do, we probably don’t think about it enough. Women in 2016 have the right to choose whether or not to attend college, whether or not we will be doctors, lawyers and mothers and while this may seem like old news, it’s easy to forget that, even the most ordinary of privileges came to be because someone fought for it. August 26th, is known as Women’s Equality Day in celebration of the 19th amendment, which was ratified in August of 1920 giving women the same right to vote as men in America. The effort to make today Women’s Equality Day was pioneered by Rep. Bella Abzug (D-NY) in 1971. Abzug was denied from the Harvard Law program, due to her gender, however, she went on to graduate with her law degree from Columbia University. She took on many civil rights and labor law cases, before running for a seat in the House of Representatives. Abzug dedicated her life to social justice and the furthering of equal rights for all men and women. After the end of her political career, Abzug continued on to found the Women’s Environmental Development Organization. Throughout her professional career, Abzug was known for wearing her signature wide brimmed hats, which she did to establish professionalism. She said that when she didn’t wear hats, someone would always ask her to get the coffee. Many women have fought, and continue to fight for gender equality, but there is still much work to do. According to the United States Agency for International Development (USAID), girls are more likely to drop out of school than boys in Haiti and they face under representation in the judicial system for gender-based violence and sexual assaults. Through their water and sanitation projects, Pure Water for the World works toward gender equality and seeks to provide equal opportunities to girls and women in Haiti and Honduras by: engaging them in community WASH projects, empowering them as community agents, and encouraging them by providing menstrual hygiene education that is not readily available to them. On days like today, we should take a moment to reflect on how different our lives would be, if it weren’t for many of the basic human rights we enjoy and those who fought for them. Reflect on how the right to vote changed our organizations and, most importantly, how we can continue to expand the right for equality to those who are still denied it. Today is more than a celebration of the right to vote, it’s a celebration of the women who fought for it and for those who continue to fight for gender equality for all. Equality is more than the right to vote, it’s the right to choose your own career path, the right to full legal representation, the right to equal pay, the right to education and the right for women in all countries to be empowered in the areas where they live and not to have contaminated water stifle their opportunities. To learn more about PWW projects empowering women, visit some of our recent blogs on women and education in Honduras as well as our menstrual hygiene program. 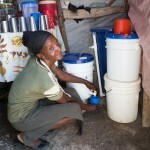 Uncategorized Haiti, Honduras, menstrual hygiene, sanitation, water, women. permalink.